I know a fair bit about Mary Pickford. My first semester of college I took a film class and Eileen Whitfield‘s book Pickford: The Woman Who Made Hollywood was required reading. I loved the book and was fascinated by one of the most important women in film history! Unfortunately we didn’t see her films so I was beyond excited when KC decided to devote this weekend to giving Mary Pickford some love and showcasing her talents to a fading audience. Even sadder…the film I’d originally wanted to do The Little Princess (1917) is only available as a DVD extra on a very expensive DVD so I was forced to change. Thankfully, everything worked out because I was still able to capture the spirit of The Little Princess by discussing Mary’s take on an even more iconic figure…Cinderella. The story is time-tested but there’s a spirit about Mary that livens up this film and, dare I say it, a very moral message that I didn’t have as big a problem with. Need I tell you the story? 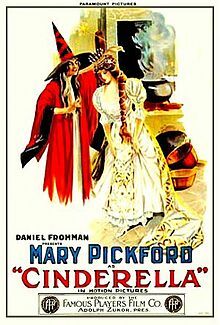 Cinderella (Mary Pickford) is a servant to her stepmother and stepsisters. When her family is invited to a ball given by Prince Charming (Owen Moore), Cinderella fears she won’t be able to go. With the kind help of her Fairy Godmother (Inez Marcel), Cinderella is transformed and goes to the ball…the rest you HAVE to know by now! Sadly, in watch the 52 minutes presented above one can see how Mary’s films are pretty neglected. The scenes in the forest where Cinderella is gathering wood and first meets the Prince are completely washed out. At times I had to squint and keep the screen small to make out characters. The rest of the short, being on a pixellated computer screen, looks grainy and it’s hard to truly see character expressions. I’m not sure if the DVD is any better, I doubt it, but it’s just sad watching a sweet short like this and seeing how time has ravaged it to pieces. Sadly, Mary’s films are being allowed to languish and deteriorate. Hopefully, this short will be around for a while! In terms of the short itself, it’s presents well-worn territory although it does take a few liberties that I didn’t expect. The Fairy Godmother is first introduced as an old beggar woman, testing the worth of the stepmother and stepsisters. They of course rebuff her and when she meets Cinderella, the girl is kind to her. This proves to the Fairy Godmother she’s worth protecting. The film has a straightforward message that’s reiterated at throughout the film, complete with title cards like the one above, that good things happen to good people. The Fairy Godmother is played by Inez Marcel but there’s the element of a village of godmothers, ranging from women to children, that show up like sprites to help Cinderella throughout the film, well before the ball. In fact it’s through this group that Cinderella and Prince Charming meet in the forest in the first place, a “fated” meeting in many ways. The dissolve effects on the godmothers is pretty good for 1914. It always astounds me what these silent film directors were able to accomplish with such limited means (kind of wish some directors today did that). Mary herself is so bright and lively in this film. She was 22 when this film was released playing a young girl and she excels at this (as she would throughout the majority of her film career). She’s shy and reserved in front of the prince, played by secret husband Owen Moore who she has sweet chemistry with, which leads to all sorts of comedy like her facial expressions when she discovers her leg is exposed. Obviously her acting prowess is in her facial expressions and there’s such humor that is conveyed in her face. She’s a young girl who dreams out loud yet is forced to hide it, like how she coyly hides her smile when the prince kisses her hand. Mary also makes her Cinderella clever and resourceful. There’s a scene where the stepmother tries to beat her yet Cinderella deflects her by pointing out a mouse. 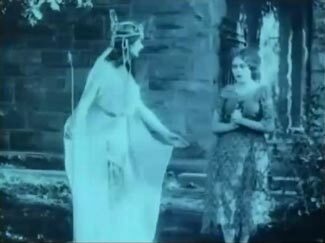 In the scenes where Mary is on her own is when the true longing and fairy tale sensibility is shown. She becomes pious and devout, praying in one scene, lovingly making her paltry bed made of straw. She’s never bogged down and her smile is infectious. If there’s one thing I enjoyed more in this than in any Cinderella story it’s that Mary doesn’t play the character as sickeningly sweet or stupid, just go back and look at the face she makes at the Godmother when she’s asking for mice. She looks at her like she’s crazy. Even though there’s no dialogue she has this light about her, an inner strength that can’t be quenched. It’s not the role of a child but a young woman, even though when she’s transformed for the ball she’s in her trademark ringlets of a little girl. The ball scene is a solid mix of romance and comedy. There’s a wealth of emotions that crosses Mary’s face when she’s transformed and the best scene has to be her poking and tickling the footman (who once was a rat). She actually delays her entrance into the ball to tickle him as he becomes visibly annoyed and swats her away. Pickford has such great comedic timing and that scene is so genuine because if rats were turned into people in front of you wouldn’t you test out how real they were? The stepmother/stepsisters are deliciously over-the-top for this time period. It’s obvious they’re heavily made up, complete with fake noses on the sisters. There’s a scene where the group goes to a fortune-teller that seems directly ripped out of Macbeth complete with a cauldron and the fortune-teller in a witches hat. Even the witch’s prophecy is like Macbeth in that she tells them “a member of your family will be the prince’s wife” and of course there’s a double meaning in that! The film also boast an interesting animated or stop-motion dream sequence that is surreal in many ways. Mary takes a tired story and tries to liven it up with an infectious performance that I adored. I’d be interested in seeing more of Mary’s work, hopefully stuff that’s easier to find and better restored. Either way, watch Cinderella and be captivated by the little girl with a big heart! I have not seen this version of Cinderella. 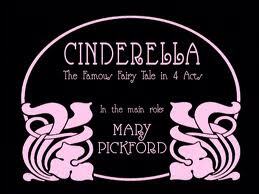 Although.. I’ m sure Mary Pickford would make a believable, Cinderella with her wonderful personality. Thank you for posting the movie, I will check it out later.. I was surprised by how much I enjoyed it! And for a 52 minute movie it packs more acting talent and enjoyment than most 90 minute films. I’m so glad you enjoyed Cinderella. I know how disappointed you were about The Little Princess. Hopefully you’ll be able to see that someday soon! I love the footman tickling scene so much. This is such a subdued role for Mary, but the way she adds amusing moments like that, and the mouse scene give it great energy. Of course, the fake noses help too. Did the soundtrack kind of drive you crazy though? Sometimes I liked it, but the vocals were a bit cheesy. It was too modern. Great post. Thanks for contributing! The hymn like part was probably the most grating because it was so ridiculous in the context of the film, gotta love silent scores applied to these films later on. I’m definitely going to try to hunt down that DVD, it’s become an obsession! Thanks for inspiring me to see this! If you guys want to hear a really bizarre Pickford soundtrack, you need to get ahold of the Little Annie Rooney DVD. It contains a soundtrack that was meant for another film and even has some guy snoring in the background and jingle bells playing during a traumatic moment. I also liked how in this version of Cinderella, you encounter the “fairy godmother” at the beginning of the film as a beggar woman. That was definitely not in the disney version of the story. As mentioned, you gotta love how careless some people are with these soundtracks. I once watched Birth of a Nation with a soundtrack that included Pomp and Circumstance. I didn’t know what was more painful, the film or the song! I definitely enjoyed the fairy godmother testing the group, it was reminiscent of Beauty and the Beast (the Disney version). You are so right about her films being sadly neglected. But no matter what the state of the film, Mary’s brilliance shines through. Maybe the new biopic in the works will spark renewed interest in her. Thanks for a lovely post. I’m definitely excited for the biopic, I’m hoping it’s as good as Chaplin. Yeah I felt Cinderella being so early in her career is the worst in terms of quality of the film stock, here’s hoping some studio decides to do a proper restoration of it. Thanks for reading! There certainly wasn’t a more enchanting, likable Cinderella for me than Mary Pickford! i haven’t seen this film for quite some time and hopefully i’ll get to see it again one day. I’m such a fan of her early silents and this review was such a fun read. Very enjoyable and a fine contribution to the Blogathon. I love Cinderella, Beauty & The Beast and Sleeping Beauty. She could sleep away their separation & save you the wtiirng LOL. I do not want to be a party pooper, but there’s a book coming out shortly with the same title by Luann Mclane.Just in case that matters although it would not matter to me as a reader. It would definitely be a different movie. I have seen these Luann Mclane books, fairy tales seem to be the “in” thing to write about. Thanks for reading!